Nalwagarh has it all, havelis, bazaars, stay options and is in middle of the region so serves as abase for tourist in this region. Founded in 1737 AD by Thakur Nawal Singh Ji Bahadur (Shekhawat), Nawalgarh was surrounded by a wall and four gates allowing entry to the village. Numerous merchants had their orgins in thi town. The famous Goenka family was also from this town. 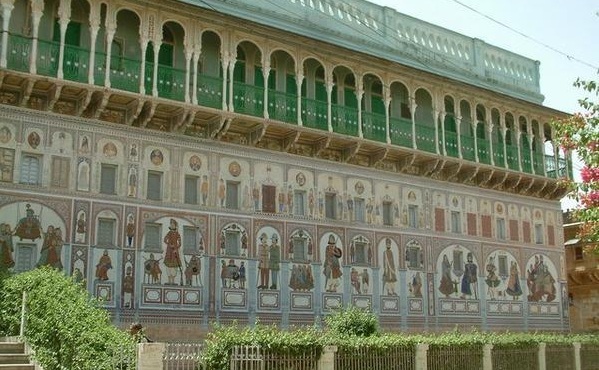 Many rich traders in Jaipur can trace their origins to Nawalgarh. Fatehgarh Fort: It was built by Thakur Nawal Singh and his descendants. Roop Niwas Kothi(Palace) : It was built by Thakur Roop Singh Ji and Rawal Madan Singh Ji. Shri Gopinath Ji Mandir : It was built by Thakur Nawal Singh.